With the launch of Los Angeles’ CicLAvia this October 10, 2010 we think this is just the right time to show that, yes, there are bikes out there for people with stuff to carry. Large, high quality cargo bikes are not a big money maker in the North American bike business, and they likely never will be. They are expensive to ship, expensive to build, and the price for the customer is higher than a regular bike. What’s more, they take up a lot of room on the showroom floor – which hurts the sales of other bikes. So, why carry them at all? We carry cargo bikes because we believe in them. We know first hand the transformative effect they can have on a family’s life and finances. Our shop is dedicated to “beautiful bikes for everyday life”, and children, pets, and cargo are a part of everyday life. Late in 2009 we received a shipment of Nihola cargo trikes from Denmark. After some wrangling with Nihola HQ this summer, it looks like we’ll hold onto the right to continue to sell these excellent cargo trikes for at least a few months more (until they are all sold). Nihola cargo tricycles are the Mercedes Benz of this bike class. Their finish is done to the highest standards, their safety ratings are the best. 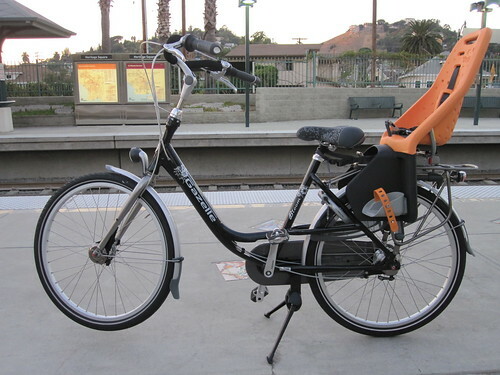 A Gazelle Bloom 26″ equipped with an orange Yepp Maxi. Our line of baby seats is exploding with colors this fall season, as we’ve added Yepp baby seats (from Holland’s oldest baby seat maker, GMG). We’ll continue to stock the Bobike Junior (the only 75 lbs. capacity baby seat we trust), but will likely cut short our stock of Bobike Mini’s and Maxi’s once we’ve sold out our current stock (unless we can acquire some Basil brand Bobike seat pads!). We’ve also expanded our range of cargo bikes to include the Gazelle Cabby bakfiets and the Gazelle Bloom 26″ and Bloom 28″. These compliment the Batavus Personal Delivery bikes we stock as tough two wheelers made for hauling kids and stuff in compact spaces. The Bloom and the Cabby feature a very high finish on all the components – showing a lot of careful design and fabrication went into making each bike. The Personal Delivery shows it’s industrial roots with a more rugged appearance (and a massive serial number stamped through the frame to scare would-be thieves). Flying Pigeon LA will have Christiania bikes for sale at our shop in October 2010. This October we’ll introduce Christiania bikes, from boxcycles, to Los Angeles. These will retail in the $2,500 range (we’re not sure until we’ve paid customs, shipping, etc. on the bikes). These trikes keep costs down without sacrificing safety and durability. Christiania bikes also offer a tighter turning radius than the Nihola and the capacity to carry more kids in the Christiania’s larger box. A rain canopy and other essential trim will also be included in the package. Though we’ll never become millionaires selling cargo bikes, we believe in them deeply. We’ve doubled down on our bet that plenty of people are looking for an economical and fun way to take care of life’s daily tasks. These quiet, handy, durable, machines have the power to change lives, and change the way we think, in Los Angeles.